Located at the San Bernardino International Airport, NTS San Bernardino Rocket and Fluids test laboratory provides specialized fluids testing with high-level expertise in space applications, including high pressure/high flow fluid and rocket engine static test capabilities. This facility supports the strictest testing requirements of aerospace, renewable energy, oil and gas and Navy Nuclear, high pressure/high flow. We are a robust ground test facility for aerospace propulsion development testing; staffed by experienced managers, engineers and technicians. In more than 50 years of operation, we’ve maintained a superior performance record and an excellent safety record. Our premier facility hosts specialized test equipment and offers unique test capabilities for high pressure fluids. The team philosophy is to apply professional approaches to achieve superior test results while operating in full compliance to all regulatory requirements and environmental responsibilities. Our NTS San Bernardino facility is designed in accordance with API and ASME power piping codes, and all pressure vessels are ASME coded and commissioned for use in California. In addition, we are in full compliance with all federal, state and local agency requirements, including the South Coast Air Quality Management District. The thrust measuring system (TMS) can measure to 50,000-lbf thrust and 8,000-lbf side or asymmetric loads. Test articles are fired into a water-cooled duct designed to handle a 50k-lbf thrust rocket engine. With this duct, we can operate larger engines while mitigating sound levels. The TMS utilizes electric motors to remotely check load cell calibration prior to hot fire testing. Our data acquisition system resolves the forces and bending movements for all three axes and logs them as calculated data channels. NTS San Bernardino’s specialized large run tanks and pressure vessels, valves and components have been augmented by 18 additional pressure vessels from the former Boeing Rocketdyne Santa Susana Field Lab (SSFL). Many of the large pressure vessels are cryogenic storage tanks, steam blowdown vessels or pressurized run tanks. These unique, heavy-walled ASME coded vessels range in MAWP from 2,500 to 5,500 psia. 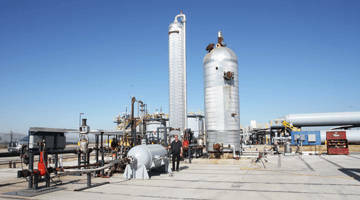 Our cryogenic fluid storage area consists of three 13,000 gallon liquid nitrogen tanks, one 13,000 gallon liquid oxygen tank and one 9,000 gallon liquid hydrogen storage tank. The tanks can be selectively filled to support independent testing activities or feed liquid to high pressure positive displacement pumps and vaporizers. The vaporizers are ASME-coded for use at a liquid hydrogen temperature of -423°F. All pressure piping conforms to ASME B31.3 code design and is installed by certified welders with post-weld X-ray inspection as required. This site has the capability to store LH2, LO2, LN2, liquid CO2 and liquid methane as well as pump and vaporize cryo fluids up to 12 lbs. per second. NTS San Bernardino has a collection of three vacuum jacketed stainless steel propellant run tanks in 2,500, 3,000 and 5,000 gallons; allowing the capability to support many different propellant combinations. They are equipped with both remote and local tanker truck fill ports, and a high-flow GN2 pressurization system for tank blowdown. The tanks feature both DP and resistive type tank level indicators that output to displays, data acquisition and control systems. In addition to our propellant run tanks and flow systems, our facility contains eight gaseous nitrogen vessels with a volume of approximately 600 feet and a maximum allowed working pressure of 5,500 psig at -20°F to 150°F. Each pressure vessel has 3 inch ANSI Class 2,500 gate valves attached to the outlet, and are manifolded together to enable maximum flow capacity to the various high-flow, dome-loaded regulators. We have a large blow down tank capacity with over 800 feet of ASME-coded vessels rated at 4,475 psig at 700°F. 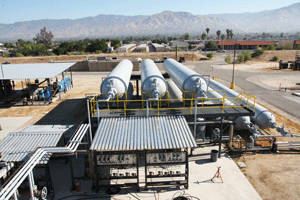 The steam/water tanks can deliver constant test pressure to one of four test pad locations. 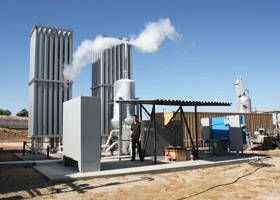 In addition to the steam system, NTS San Bernardino can conduct tests with cryogenic fluids, high-flow gases and water at pressures ranging up to 4,500 psig. 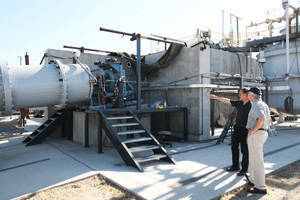 NTS San Bernardino recently designed, built and verified a quiet technology test facility to MIL-STD-740-2 (SH). The 17.5′ x 12′ soundproof enclosure is capable of a minimum pressure of 5 psig, minimum flow of 5 SCFM, and a maximum pressure of 5,500 psig with maximum flow of 20,000 SCFM. The accompanying control room consists of low-level microphones ranging from 15 dB to 140 dB. Data can be acquired up to 24-bit resolution with a sampling rate up to 100 kHz and 8 channels. It is DACS capable of automated sequences with redline control. 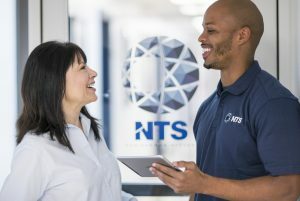 At NTS San Bernardino, our equipment is designed to give you the best results with regard to data acquisition to help with the detection of leaks and life cycling predictions. Our primary LabView-RT data acquisition and control systems consist of 224 analog input channels, 64 digital inputs and 192 digital output channels, and is based on the National Instruments PXI/SCXI real-time architecture. 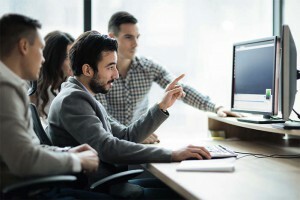 Any combination of data channels can be monitored with redline control logic applied to initiate an automatic safe shut-down should customer-defined limits be measured for a prescribed period. We have three other NI LabView control systems to allow setup and test of a total of four simultaneous tests. The NTS San Bernardino video event recording system can record up to 20 minutes of imagery (640 x 480 resolution) at 200 frames/sec. The system can also capture, compress and record up to two hours of image data from six low speed cameras. It was designed so the images from all 8 cameras can be displayed in real time. Two high speed Mikrotron 1303 cameras with fiber optic extenders. Six Cohu 3695 iView cameras with remote Pan-TIlt-Zoom and 500 feet of power and control cable. Dedicated PCI-X computer with Streams 5 Software and 3.2 GHz Intel Xeon CPU. To learn more about NTS San Bernardino capabilities and services, click here to download the fact sheet. Or to begin discussions about your next project, Request a Quote now.